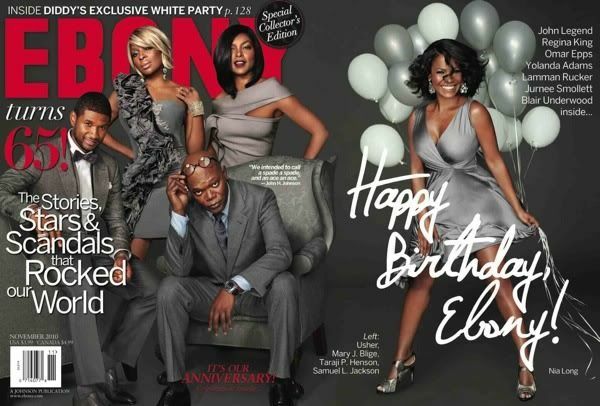 Nia Long, Mary J. Blige, Samuel L. Jackson, Usher, and Taraji P. Henson cover the November issue of Ebony Magazine whichs celebrates the magazine's 65th anniversary. Congratulations to the Johnson family for continuing to be a model of what ownership can look like in the black community. Ebony has gone through some hard times in the past couple of years (what business hasn't), but yet it continues to be black owned and a shining beacon of possibility within our community. So with that being said, I want to wish Ebony a Happy Birthday and I pray many more. Rest in peace Eunice and John H. Johnson! Wow what a beautiful cover! I love the grey theme.